An 80-year-old woman who was trapped in her home is the third fatality from historic floods overwhelming parts of the Midwest. At least 16 rivers are flooding, with the worst along the Nebraska and Iowa border. One reason the flooding is so severe is because of the region’s massive snow accumulations and sudden rise in temperatures. The dangerous flooding, caused by snow melt, ice jams and last week’s rainfall, washed away roads and bridges, isolating some communities. 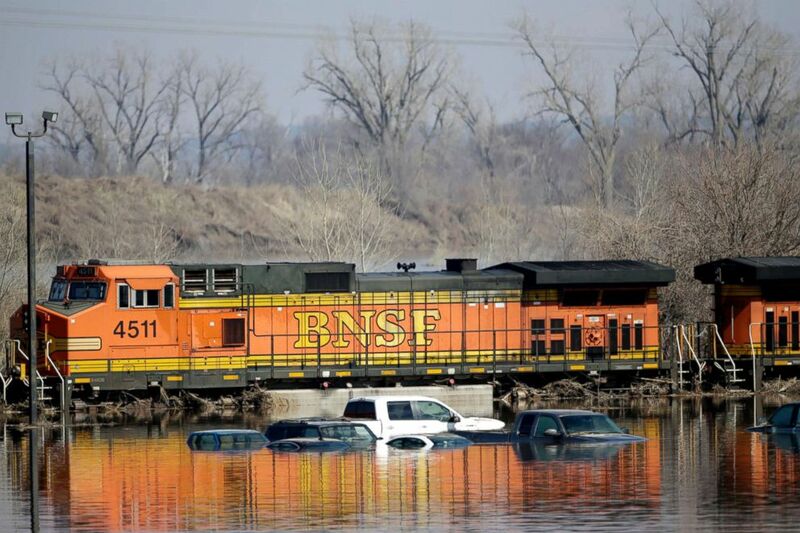 (Nati Harnik/AP) Cars sit in flood waters from the Platte River alongside a BNSF train, in Plattsmouth, Neb., March 17, 2019. A Nebraska man died when he drove around a barricade and was swept away in his vehicle, The Associated Press reported. A Nebraska farmer died when he was trying to reach stranded drivers and a bridge collapsed, the AP said. The body of 80-year-old Betty Hamernik was found in her home in rural Columbus, Nebraska, according to the Platte County Sheriff’s Office. Over 100 people have been rescued and more than 870 are staying in shelters, according to officials with Nebraska’s Office of Emergency Management. (ABC News) Flood alerts and warnings have been issued this morning in the Midwest. One third of the structures at Nebraska’s Offutt Air Force Base are underwater, a spokesperson told ABC News Monday. 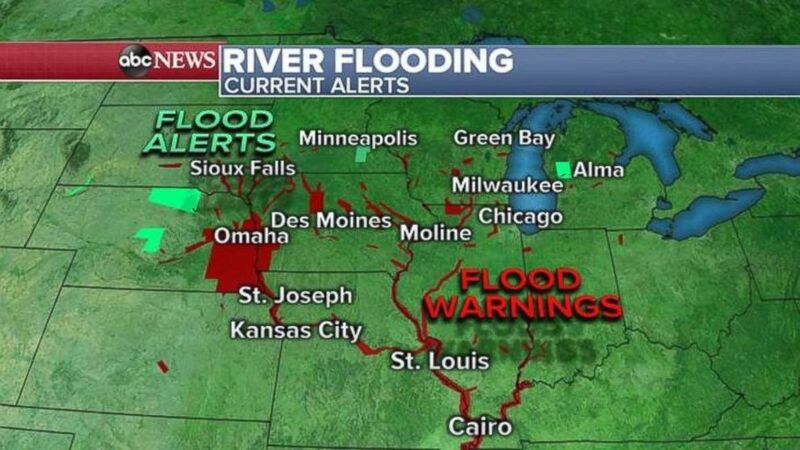 River flooding is also ongoing in other parts of the Midwest. 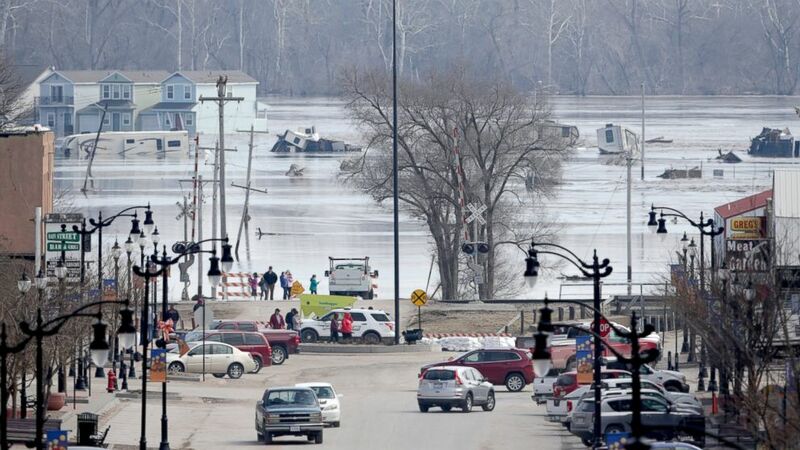 (Nati Harnik/AP) People view the rising waters from the Platte and Missouri rivers which flooded areas of Plattsmouth, Neb., Sunday, March 17, 2019. Hundreds of people remained out of their homes in Nebraska, but rivers there were starting to recede. 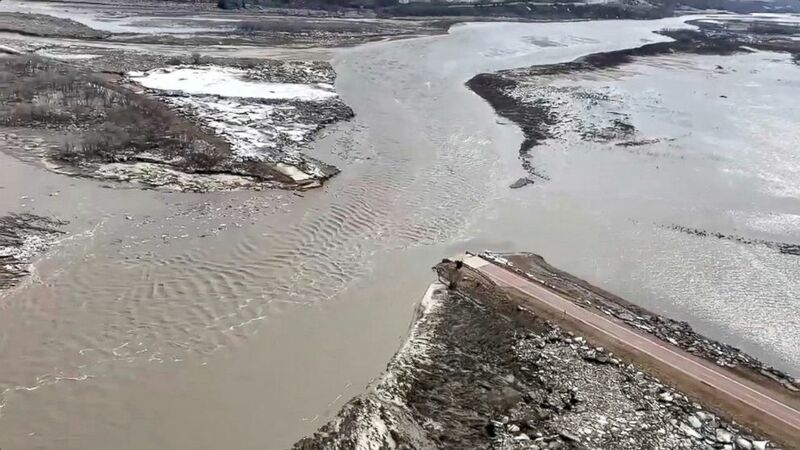 (Office of Governor Pete Ricketts via Reuters) Highway 12 is seen damaged after a storm triggered historic flooding, over Niobrara River, Neb., March 16, 2019.